VX03c COBRA EXHAUST fit Vauxhall Astra H VXR 05>11 Sports Cat Section (200 Cell). 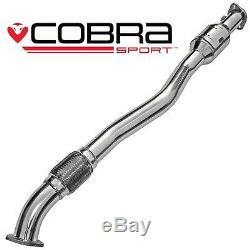 VX03c COBRA SS EXHAUST fit Vauxhall Astra H VXR 05>11 Sports Cat Section (200 Cell). The heritage in the UKs performance exhaust market spans over four decades with a proven track record of a commitment to continuous improvement and investment in new exhaust technology. This commitment has resulted in the company being awarded the Made In Sheffield mark which is a symbol of excellence in manufacturing which is recognised worldwide. Cobra Sports range of performance exhausts demonstrate the highest quality of manufacturing, each system is hand-made in Sheffield and in-house expertise ensures that all Cobra Sport Exhausts are engineered the highest tolerances ensuring a perfect first-time fit, great performance and a truly pitch perfect exhaust sound. Cobra Sports Exhaust production facilities are geared up to producing performance exhausts in high volume, not only for themselves but also for clients such as Subaru UK, Isuzu UK and Ginetta Cars, to name a few. This does not preclude working for clients on an individual one-off basis for proto-type or custom developments whether that be for road, track or race exhausts. Precision power, matched by sensational looks and an inspirational sound is the Cobra Sport promise. Cobra Sport brings four decades of innovative design and unparalleled manufacturing expertise to their range of performance exhausts that match the aspirations of the most demanding driver. Engineered to the highest tolerances with Mandrel tube bending to ensure a smooth unrestricted airflow, advanced manufacturing techniques and superior TIG welding procedures produce a superlative finish, while total precision and extensive testing ensures a perfect first-time fit and a truly pitch-perfect sound. Subaru UK have been working closely with Exhausts UK since 2009 to develop a wide range of high quality stainless steel exhausts systems for the Subaru vehicle range. Cobra Sport back boxes are filled with continuous E-Glass fibres. These fibres are able to withstand severe thermal shock remaining stable in arduous environments. E-Glass fibres have excellent heat and sound absorption properties along with the ability to recover from extreme compression, offer excellent acoustic properties and remain stable at high temperatures in excess of 850 Deg C making them ideal for use in performance exhaust systems. Tungsten inert gas (TIG) welding is used on all Cobra Sport exhaust systems giving a superior finish to MIG welding and the highest quality exhaust welds available on the market. The TIG welding on the back boxes and pipework produces a very precise weld leaving no splatter and extremely neat edges. Our lifetime guarantee covers manufacturing and material defects for the original purchaser. However, please allow up to 20 days for deliveries as stated in our Terms and Conditions of Sale. We would advise waiting until all goods including the fitting kit are received and checked prior to booking in vehicles for any fitment or related work. We always recommend that you have your exhaust fitted professionally for safety reasons and to ensure the perfect fit. There are many garages able to provide this service and we are happy to make recommendations in your local area. Will my exhaust require any maintenance? Regular cleaning/polishing will be required to maintain the polished appearance of the system and tailpipes. Mounts and rubbers should be checked annually and may need replacing from time to time over the life of your exhaust. Provided these items are checked and maintained, your exhaust will provide many years of trouble free motoring. Will I get a fitting kit? Yes we aim to send all the necessary parts so you can fit our exhausts to your car with ease. Do I have to modify my car to fit a Cobra Sport exhaust? No, our exhausts are designed to be exact replacements for original equipment exhausts and we provide a fitting kit so you will have everything necessary to fit one of our systems to your car. What is a'Blackout' ceramic coated tailpipe? Some of our exhausts come with an option of a Blackout tailpipe, these not only look aesthetically pleasing, but they are also ceramic coated which keeps the heat of the exhaust gasses away from any bodywork or trims. How are your exhausts made? All of our exhausts are made from aircraft grade 304 stainless steel and constructed using precision TIG welding with mandrel formed bends in the pipe work for a smoother gas flow. However, with careful design and production methods, we aim to keep a subtle sporty tone. If you prefer a loud system, then one of our non-resonated (no centre box) exhaust systems will provide a louder exhaust note. Many of our products feature a movie of the exhaust and give some idea as to the sound which you can expect. What power gains can I expect to achieve? Of course this varies from engine to engine, our systems are designed and manufactured to maximize gas flow with increased diameter pipe work, free flowing silencers and mandrel bends which provide a much less restrictive exhaust system than original equipment exhausts, resulting in a much better engine response and increased BHP. Typically you can expect to achieve around a 10% increase from the installation of a cat-back system. Some individual products also show approximate power gains. Is it legal to put a sports exhaust on my car? The below is to be used simply as a guide. UK, USA & Australia - (No set decibel level at the discretion of the tester if it is road worthy). You can only de-cat your car if it was registered prior to 1992, otherwise it will fail the emissions check at your MOT station. Will my car need remapping? If you are fitting a cat back system to your car, this will have no effect on the engine management operations. However, if you are replacing your original system with a de-cat, sports cat or front pipe your car may need remapping as it may cause the vehicles engine management light to activate. What is the difference between resonated and non-resonated systems? Resonators are box chambers incorporated into the exhaust system, which are used to make the exhaust quieter, by cancelling certain sound frequencies. A non-resonated exhaust system will therefore, give a louder exhaust note and a resonated exhaust system, a quieter exhaust note. Either option will still provide extra performance and an enhanced sound compared to the original equipment exhaust. What is a Slash-Cut tailpipe? Slash-cut tailpipes are finished and cut off at a 15 degree angle, and suit certain types of vehicles depending upon the shape of the bumper and overall aesthetics of the vehicle. If you require any advice on which tailpipe would be most appropriate for your car, please give us a call. What will be the finish of my exhaust? All our exhausts come with highly polished mirror finish tailpipes and rear boxes. All other pipework and gaskets etc, will be a matt polished finish. If you do require highly polished pipework this is now available as an optional extra when purchasing via our website. How do I keep my exhaust looking like new? If you do not clean your exhaust/tailpipe, it will eventually become discoloured and be more difficult to bring back to its original finish. Regular cleaning with a non-abrasive metal polish such as Solvol Autosol® will ensure that your exhaust continues to look as new. We pride ourselves on a quality service and we are happy to address any concerns. The item "VX03c COBRA EXHAUST fit Vauxhall Astra H VXR 0511 Sports Cat Section (200 Cell)" is in sale since Wednesday, March 29, 2017. This item is in the category "Vehicle Parts & Accessories\Car Tuning & Styling\Performance Exhaust\Complete Performance Exhausts". The seller is "dusty789blue" and is located in Leatherhead.